I walked this, the 16th stage of my Grand Norfolk Hike, in early August 2013. I hopped on the train to Norwich where I caught a bus to the Suffolk town of Bungay. My destination, the seaside resort of Lowestoft, was some 20 miles to the east. I picked up the Angles Way long-distance footpath just outside Bungay. 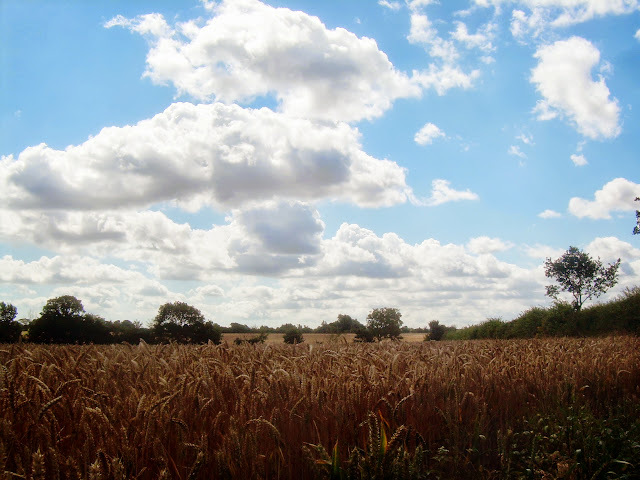 I spent a very enjoyable couple of hours walking through cool green corridors and alongside summer fields of wheat, standing golden in the sunlight, ready for harvest. I reached the pretty town of Beccles where I continued the hike along the banks the River Waveney. I followed the river for ten miles, passing many boats. I met two other hikers coming from the other direction, they were looking forward to a pint in Beccles. Other than that the path was empty of other walkers though there were many anglers present. At one point, not far from Lowestoft, I stopped for a quick nap on the path. I slept for half an hour or so, I don’t think anyone passed by. Finally I reached the suburbs of Lowestoft and found an off-licence where I could buy a can of cold beer. I had been greatly looking forward to sitting on Lowestoft beach and chugging down a lager. A passing person kindly took my photo. I took my shoes off and walked on down to the sea. I had arrived! I had walked from my home to the sea and could go no further! It felt like an important moment, profound and with meaning. I had a big smile on my face as I paddled along the seashore. …and all was well with the world. Bikes are good as well as they extend your reach and can take the load off your back…and as for beach huts…love them! That brought back lots of happy memories of walks 25 years ago in the same area. Great pics Martin! Especially like the boats and clouds and your shots on the beach. So what is the meaning????? The Waveney is beautiful . beach huts remind me of wonderful hols at Hunstanton,Brancaster and Southwold which have great E. Anglian beaches. Unfortunately Southwolds are totally beyond my budget at 125K !!!! The pier, the beach huts, the sand and the water -it all looks so wonderfully inviting. Thank you for sharing this; it conjures up magical moments.